As a family historian, I know I am very fortunate. 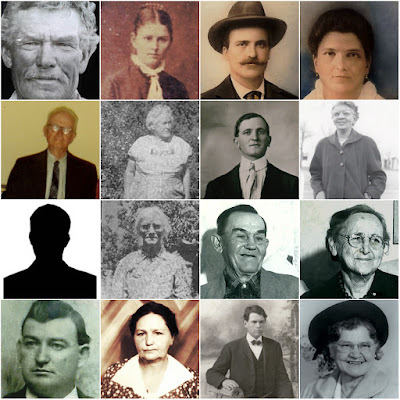 I have a photograph of nearly all 16 of my 2nd great-grandparents. I know what each of them looked like except for one: William B. Upton. The thought that a photo of him may be out there floating around is maddening. It's as though I have a nearly complete collection of dishes. I'm just missing the plates. The collector in me wants a complete set. The family historian in me wants to scrutinize his face to see if I can discern a physical resemblance. William was born in the town of Bowen in Madison County, Arkansas in about 1848 to John Wesley Upton and Martha Bowen. There's speculation that his middle name may have been "Bowen" but there's also speculation that it was Billy (although it seems more likely that that was a nickname for William). John was a Civil War veteran who, upon his enlistment with the Union forces, received an inoculation for smallpox that was contaminated with syphilis (see Disease in the Civil War). On May 27, 1865, John wrote a letter from Ft. Smith, Arkansas to his family. John wrote, "Tell Will to work and make him another hat and be cirten (sic) and not let the Rebels get it." Family lore says that William made himself a hat to replicate his father's union uniform cap, but it was stolen by roaming Rebels. In this same letter, John writes, "Tell Will and Johnny I will send them something the next time. I have no more money now to by (sic) them anything with." In 1899, when John was on his deathbed, one of his granddaughters remembered that he asked that "his little girl" be lifted up on the bed so he could see her once more. She recalled that he had a long white beard. Did William have facial hair like his father? William's first appearance on the U.S. Federal census occurred in 1850 in Bowen, Madison County, Arkansas. At four years old, he was enumerated as the eldest child in the household along with a sister. In 1860, William's age was given as 12 years old suggesting a birth year of approximately 1848 (and conflicting with the 1850 census). Still in Madison County, Arkansas, he was listed as the eldest of five children and the only son. The sister enumerated in 1850 was not listed in 1860. She presumably died in the previous ten years. Did any of William's surviving siblings receive a photo of him? Is there a photo in the collection of their descendants? In 1870, William was enumerated as a 22 year old farmer living in Arkansas with his wife Susan and their first child, a daughter named Elizabeth. In 1880, William was enumerated as a 32 year old farmer living in Arkansas married to Susan. They had five children: three daughters and two sons. In 1900, William and Susan were enumerated in Idaho living near their daughter Margaret Jane "Peggy" (Upton) Brame. His birth was given as October 1848. He and Susan had been married for 32 years, and had five children - all of whom were living at that time although none of them were enumerated as residing in the household. Did any of the five children receive or inherit a photograph of their father? Does a photograph exist in the collection of any of their descendants? According to his headstone, William died on February 3, 1904. His passing in the early 20th century means he lived well into the age of photography. Surely, there's a photograph of him somewhere, right?! The sleuth work to track down the descendants of William's siblings (of whom there were seven living in the 1900 census) and his children is underway in the hopes that one of them has a photograph that will fill the void in my collection of ancestors. I love the signature idea. Unfortunately, he was illiterate and didn't even write the letters himself (a fellow soldier did). His headstone could suffice. Thanks for the comment, Cathy. Much appreciated.